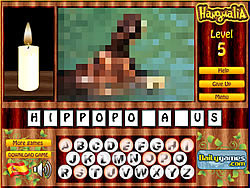 In this game you'll be shown blurred pictures of animals. Your goal is to guess what animal it is. You do it selecting letters. If a letter is present in the animal's name, it'll appear at its place. If you press a letter that is not there, the candle yo have in the left hand side of the screen burns out a bit more and you get closer to lose the game.